Evolution is the process of change in the gene pools of species over time. A species is a particular kind of living thing and its gene pool is all the genes in all the individuals of that species. 1. The inherited physical and behavioral characteristics of organisms (living things) are transmitted by the genes from one generation to the next. 3. In all species, more offspring are born than can survive because long-term there is not enough food available for them all to survive. 4. The genes of those that do survive are passed to the next generation. 5. Individual organisms do not evolve. They can change, but evolution is the difference between the gene pool of one generation and the gene pool of the next generation. 6. The entire Biosystem evolves all at the same time together. The function of the natural Law of Evolution, the basic Law of Life, is to maintain LIFE by mainaining a viable BALANCE among all the interacting factors at all the many levels of the Life on Earth. The next question is – what is a Level of Life.? And how do they interact? The diagram below needs explanation, but it won’t be easy, because the Bosystem is so complicated that it is impossible humanly to represent or to fully understand. If you find it mind boggling to comprehend the levels of organization, all interacting among and between themselves, then you are just like the scientists, the politicians, the religious and everyone else. Fortunately, we do not need to understand all the little details of the system in order to have a good idea of how it functions — the structural and functional requirements for it to stay alive — and that is our goal. A basic appreciation of the beautiful idea of networking. and of the levels of organization, is background for understanding the flow of energy, and of other things, through the living ecosystem. Life is possible because of the internet of living and nonliving things through all the levels. The basic format of these realities is outlined in the below diagram. are flexible, a fact that is necessary for their survival (sustainability). The other is that there are just too many interactions to understand or represent. For example, looking to the diagram, there are ecosystems within ecosystems. I am a functioning part of the pasture ecosystem and the East Texas group of ecosystems and in fact all the ecosystems in the world because I contribute to the materials (such as carbon dioxide) and the energy flow and many other activities that occur within each of these ecosystems and the whole earth ecosystem. If I could draw all the lines of interaction between myself and all the other ecosystems and all the other levels of organizations, the entire page would be black. So I drew only one or two or a few lines to feebly represent just a few interactions. Imagine that everything interacts with everything on this diagram in some way(s) and also everything interacts with millions of other entities that make up the living system. For example, your heart interacts with every other component of your body; your resilience and therefore your survivability (sustainability) would be unlikely if any of these interacting components of your body were missing. All the organs work together to maintain your life. This is represented by the lines between the heart and kidney and skin on the diagram. However, it is true of every organ in your body. They all interact. Similarly, the leaves, bark and other organs of a tree all interact with each other to make the tree alive, and the tree interacts with nearly everything else in the ecosystem, including us. We are only one component of the metabolism of the ecosystem. Our lungs breathe the oxygen that is provided by plants; our food gives us the energy we require for life; the environment degrades our wastes, so that we are not suffocated in a dung-heap of the unused byproducts of our metabolism, and these byproducts are re-used by other organisms. These processes are carried out by other organism that all are interacting within all the big and little ecosystems of life on earth. We could not survive without the other elements of the ecosystem, and we also contribute to the other elements of the ecosystem. 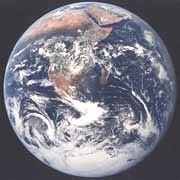 1-The whole earth ecosystem is made up of smaller ecosystems and organisms. The whole earth ecosystem is the biggest (most inclusive) organized level of Life on earth. 3-Organs are composed of specialized tissues and their environment. 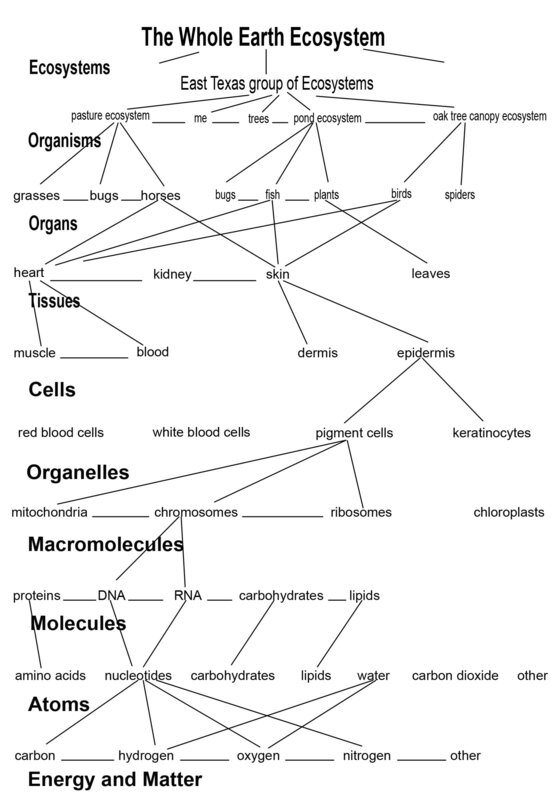 5-Cells can be organisms or they can be subunits of organisms. The cell is the basic unit of life. Below the cellular level of organization, life as we define it is not present in the interacting systems of which it is composed. However, obviously, are also necessary for Life to exist because living things are composed of them. 6-Cells would not be alive without the precisely organized organelles, macromolecules and molecules of which they are composed. 7-Organelles are subunits of the cell that perform specific functions. For example, the chloroplast is an organelle that is made up of macromolecules and molecules that, in the environment provided by the cell can do the processes of photosynthesis. Photosynthesis is the process of changing light energy to chemical energy that is used to form the energy bonds of macromolecules. 8-Macromolecules are organic molecules joined together with other molecules by energy bonds. 9-Molecules are made of atoms that are joined together in very specific ways by energy bonds. The kinds of energy bonds and the kinds of relationships between the atoms are not random. They depend upon the fact that different kinds of atoms have different characteristics. 10-Atoms can not be seen or directly measured individually. However, if we collect a few million/billion atoms of the same kind, all together in one place we would call that an element. There are not very many elements that (in their special combinations as molecules) make up all the living and nonliving things of the ecosystem. These elements/atoms are diagrammed by chemists in the “periodic table.” A lovely book by Theodore Gray and Nick Mann describes and illustrates all these basic elements (and atoms) of our existence. Atoms are studied by physicists. There are many metaphoric descriptions of atoms, but the bottom line is we do not fully comprehend atoms from our perch so much higher up in the levels of the ecosystem (just as we do not fully comprehend things that are at levels of organization over our heads. Our sensory organs are designed to function in our own level.) What we need to know is that atoms are matter (they have mass, which means they have weight and volume. Everything from your desk to your grandmother is composed of atoms). Atoms also carry the energy that we require to do any kind of action in our lives or in the ecosystem. The energy of atoms determines how the different atoms can make energy bonds with other atoms so that molecules can form, and macromolecules, and organelles, and on up the levels. It is important to know that humans do not understand most of these interactions. It’s also important to remember that any system that has more interactions, to a point, is likely to be more resilient (suggested reading linked by Albert-Laszlo Barabasi). Resilience is largely the result of complexity and is essential to life. Increased complexity of a network increases resilience because it makes available “fail-safe” options by providing several methods of accomplishing each process. Increased complexity can also increase the efficiency of energy usage (notice these elements also can be true of social organizations). However, this does not mean that more complexity is always better than less complexity. Complexity is not the only element of life that is essential, and complexity must be maintained in balance with all the other essential components of ecosystem viability. Too much complexity can be as harmful to the balanced organization of a network as too little complexity. We could not be alive if the nature of the chemistry and physics of our environment were different than they are, or if the interactions within the ecosystem ceased to function. All the levels and all the interactions make us what we are. Evolution not only functions to maintain balance among all these levels of Life. Evolution also created at least some of them. It is my personal opinion that the process of Evolution is so basic to existence that it is probably responsible for creating all the levels. And only God could create the process of Evolution. But I don’t see any reason to argue about those last two points, because it is not our job to determine how the universe functions. Our common goal and our human responsibility to God and to each other and all sentient beings is to individually and collectively do our very best to pass on to the seventh generation of humans yet to come a sustainable, reasonably comfortable human culture within a healthy Biosystem.